About Tarek K. Message Tarek K.
Tarek was THE BEST guide we have ever had. We travel extensively. Knowlegable,kind,flexible,intelligent, well spoken,comforms to guest requests,works VERY hard to please guest. Tarek is a real person that does an excellent job. We now call Tarek a friend!!!!! Tarek guided us through the busy museum in Cairo with real confidence and knowledge, pointing out the highlights in an engaging way. When asked questions he had demonstrated a very deep knowledge of Egyptology too. He took us also to the Pyramids and the more remote Gaier Anderson house. Everything was well organised, interesting and flexible. We highly recommend him. Great guide. We enjoyed our time with Tarek. He was very professional, friendly and easy to understand. Very knowledgeable about the sites we saw. We would recommend him to anyone wanting to tour Cairo. Great tour. Tarek was a very professional friendly guide. Easy to understand and very knowledgeable about the sites we saw. I would recommend Tarek as a tour guide to anyone wanting to experience Alexandria or Cairo. Outstanding tour of Cairo's historic sites, including the famed Citadel of Saladin and the Grand Mosque of Muhammed Ali Pasha! Tarek tailored the tour to visit spots I hadn't already seen and spent time explaining the cultural and historic significance of each location. A top-rate experience all around! Tarek was such an amazing guide for the 3 days we were in Ciaro. His hospitaly was superb and make us feel at ease and safe. He was very knowledageble about all the sites we saw. He made sure to fit in all the highlights! His English was excellent and he was very easy to understand. He customized our tour to what we wanted to see and do. He answered all of our many questions and took us to have local dishes where the locals eat! Tarek is truly what made our time in Cairo unforgettable. We spent 3 days with Terek and fully enjoyed our experience! Tarek was very prompt, arranged assistance in the airport and provide clean reliable transportation. Tarek was very knowledgeable and passionate about the history and sites of Cairo and surrounding area I would recommend Tarek as a tour guide to anyone looking to explore Egypt. We had a very good tour with Tarek in Cairo. He was very knowledgeable and engaging. He really picked out a great tour and accommodated all of our wishes. I would rate Tarek K. as a 5 out of 5 stars. Tarek is very friendly, professional and has a lot of knowledge of Egyptian history. He only had few hours in Cairo and he planned everything so efficiently. The thing I appreciated most was that he was able to deal with pushy vendors in a dignified way. I would rate him 5 stars and high recommend him. Nice tour! I told Tarek I wanted to see modern Cairo because I had already visited ancient attractions. He guided me through Muslim market with beautiful architecture, explaining and telling history and culture, then to downtown. I could experience real Cairo: real people on a real place. Tarek was very knowledgeable and informative about all of the Cairo sites we wanted to see and he added a very special tour of the Garbage City & the Cave church. This was the best part of the tour and I recommend it to be a integral part of tourist destinations. Prepare well & thanks for a wonderful experience! I really enjoyed the day. The guide was friendly and professional. 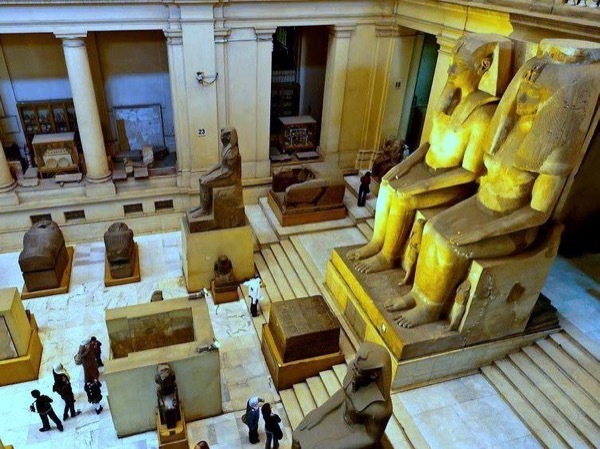 If you have a free day in Cairo this guide and or tour would both be good choices. If you are looking to something a bit away from the normal tourist stops this tour could be for you. It gives you a chance to see the Bent Pyramid and the Red Pyramid neither of which seem to be heavily visited by the kind of crowds you see at the other sites. Tarek is very personable and goes out of his way to please. I highly recommend this tour. I really enjoyed this tour. Tarek was personable and very knowledgeable. He made every effort to please and seemed eager to share the sites with us. The tour was well paced and I would strongly recommend it to anyone wishing to see the "must see" sites of Cairo. Tarek leaves one wondering what else one could possibly want from a tour guide. Not only does he make sure you see all the essential places, he can rapidly modify the itinerary to fit your specific preferences. He is the ideal tour guide and makes you feel as if you were an Egyptian local. You won't be sorry with him! Tarek was an excellent guide! He was so sincere and caring that I feel we have made a friend. We had an aggressive agenda, but with his skills we saw everything we wanted and more. I was interested in an additional place; he changed things so we could include it without eliminating anything. His English is very good, and his passion for his country is infectious. We had a cross-section of the archeological, historic, and religious sites that gave us a good perspective of Cairo. Wonderful tour! Tarek does a nice job and can certainly see to it that requests are fulfilled to the best of his ability. He effortlessly provided access to all the places I wanted to cram into a very short visit to Cairo, and threw in some local, off the beaten path type places that let me see the real Cairo. Only thing that could have been better was better communication on a segment of arranged travel, but it was certainly not anything major enough to give him any less than 5 stars. What an amazing experience! Tarek was an awesome guide. From the moment we connected with him at the airport in Cairo, he took care of us - from suggesting some of the most locally authentic (and delicious foods), to engaging in conversation about everything from politics, culture, religion and life in Cairo, to guiding us through the top sights (pyramids, Sphinx, Old Cairo, a popular market, Egyptian Museum and more) - Tarek was outstanding. Friendly, funny, and incredibly knowledgeable. A+++++! TOUR GUIDE RESPONSE: I really thank you so much my great friends and no words will be enough to express my appreciation for your wonderful feedback, can't wait to have you back. We, a german group with six persons, had a tour with Tarek through the Islamic Cairo. His English pronunciation was good understandable. He took care not only for the visit in Cairo, but also for our safe and punctual transfer to the airport, which was not included in the regular programm. He was flexibel and could react on all our wishes. We can recommend him for your local guide. TOUR GUIDE RESPONSE: Thank you so much for your great feedback It was a great pleasure for me to welcome you in Egypt , my regards for all the group. Tarek's professional and extremely knowledgeable character coupled with his sunny disposition made my first visit to Egypt a most pleasant and certainly memorable one. He went over and above his call of duty to ensure my priorities, namely ancient Egypt, are covered and then more. He is a very kind person and will certainly be highly recommended to all who seek a relaxing, informative and fun experience of discovering Egypt. Tarek is an excellent tour guide. He was very responsive as we planned the tour. This was our first trip to Egypt and Tarek was the perfect guide for us. He's extremely knowledgeable and enthusiastic about his city. We got to see the major sights as well as experience some of the local flavor of Cairo. We'd highly recommend him. We have just returned from a wonderful holiday to Egypt and wanted to say a big thankyou to ToursByLocals and your guide in Cairo, Tarek K, for an amazing two days. Tarek took us to all the places we wanted to visit, and was so informative. Tarek was a most excellent guide and companion for the day. We were able to visit Coptic Cairo as planned and also had time to see Old Cairo. He was very knowledgeable about the places we visited, as expected, and was also good company when discussing social, political and religious aspects of modern Egypt. When traveling, besides seeing art and monuments, I very much look forward to learning about current affairs. He well-deserves the 5 star rating I gave him! Tarek absolutely made our trip to Cairo! He totally dedicated 2 days to us and opened our eyes to the beauty, the history, and the warmth of the Egyptian people. He answered all our questions and we felt we could ask him anything. Our family and friends had real concerns about our safety but we never felt unsafe the whole time we were there and Tarek took us everywhere. All the people we had contact with through Tarek were honest, sincere and had our best interest at heart. Best guide and friend ever! Tarek was knowledgable and flexible to change plans to maximize activities during our short visit. Tarek was a great guide - he was knowledgeable and made plans for us to maximize attractions we could see during our short visit. What a wonderful time! Tarek is an extremely knowledgeable Egyptologist who always was on time and knew the right people to get the best deals on everything. The camel ride around the pyramids is a once in a lifetime trip and Tarek made it come alive! I highly recommend Tarek K. for any tour in Egypt. Prompt, knowledgeable and courteous. Definitely take a private tour with Tarek versus an impersonal bus tour. Tarek was an excellent and very reliable guide, who provided a bespoke and unique tour for me. Tarek is very friendly and easy to talk to and has lots of contacts to ease your way around the city. It was a great experience: thank you! I had always wanted to visit Egypt. So glad I did. My first piece of advice to anyone who might be interested is GO! You'll not regret it. My second is to use Tarek as your guide! He was a blast! Not only was he incredibly knowledgable about Egyptian history, he was a welcoming ambassador and knew some great places to go. He was so much fun to spend time with and the day felt like traveling with a close friend -- he's so much more than just a great tour guide. When we go back, he'll be our first call. Tarek was very kind, informative, and attentive to our hopes and dreams for our tour. We asked if he could help arrange a camel ride and he arranged a better-than-we-ever-dreamed of camel experience around the pyramids. We would highly recommend him to friends travelling to Cairo. This tour completely surpassed all my expectations! Tarek clearly has pride in his homeland and his tour reflected it in every way! Tarek waited patiently for me at the airport despite a plane delay. My camel ride around the Giza pyramids was breathtaking, and felt very personalized. I laughed a lot, and learned more than I expected to. I can't wait to come back to Egypt and when I do I'll hire Tarek to show me around. 5 out of 5!!! Tarek K did an excellent job. His English is excellent. His knowledge of the subject/s is beyond belief. We always felt safe. He went beyond our expectations. Takek K did a fantastic job of supplying area guides (2) because of a personal time conflict. He called us everyday to ask about our thoughts. These guides knew their stuff and could explain it to us more than adequately. Tarek and our driver did a masterful job of showing us the Egyptian Museum and the Pyramids! The restaurant they selected for us was also wonderful. We requested to see a Coptic Christian church and that was also a highlight. Again we had a wonderful experience Tarek had a company from Luxor pick us up in saphaga A drove us to Luxor and surroundings everything was excellent, food was very good and the facilities were clean and the people were friendly. I highly recommended. This was a truly excellent experience, Tarek was a superb host and Egypt was a very hospitable country. Tarek went all the way to the top of gebel mousa (mount Sinai) which is a all night affair To reach the top in the morning. I highly recommend visiting Egypt with Tarek he will take care of everything meet you at the airport and make you have a worry free visit to this very interesting country. Tarek is exceptionally kind & knowledgeable. His enthusiasm & humour brought a welcome feeling of ease & comfort during our trip to Cairo. We were there during the revolutionary protests. He always went above & beyond to get us access to unimaginable places. We went into the tent city in Tahrir Square. For travelers young & old, he offers a refreshing combination of ease and familiarity - the comforting feeling of wandering backstreets with an old friend. Tarek is more than a tour guide, he's a friend. TOUR GUIDE RESPONSE: Thank you Sean for your very positive review and your great feedback about me, I'm so happy to hear that from you, I hope that I will have you back soon in Egypt. TOUR GUIDE RESPONSE: Dear Nurul, Thank you very much for having taken the time to write a review. As I'm always trying to do my utmost for my guests’ satisfaction and to keep up my service standards your very positive feedback,especially referring the Egyptian local restaurant of the last day is highly appreciated. I'm always so Happy to be able to communicate my Happiness to my guest. I do hope that you will be back soon so that I may spoil you a bit more ! Kind regards from Egypt, Tarek K.
Our guide, Tarek, did everything possible to make the trip a success. He was very informative and spoke acceptable English. Beacuse of unusually heavy traffic, the trip took longer than expected. We did not get to see the inside of the pyramids in Cairo because of the late time but he personally arranged for us to see the pyramid light show at night instead. We would suggest he dress slightly better for appearance and that he would wait until all were present to begin discussion so everyone could hear. TOUR GUIDE RESPONSE: Dear Mr. Wells, First of all, let me thank you very much for taking the time to write your feedback. I appreciate your positive suggestions about improvement and I will take them to heart. I want to tell you that I can't wait to have you back to our own tradition of warm hospitality. Kindly accept my warmest regards from the Mediterranean sea shores. Your Guide, Tarek K.